Note: The photos below contain some post calving photos, the blood is a bit bright. 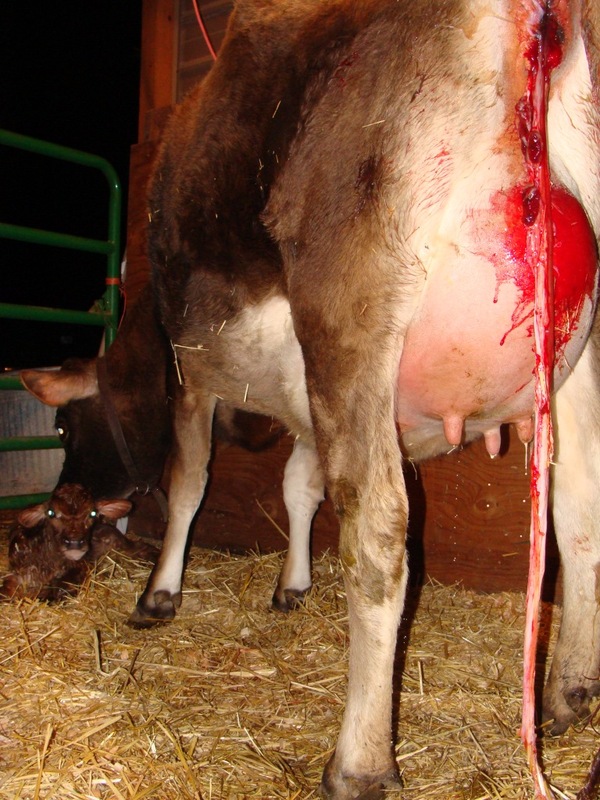 Absolutely normal for a calving, but could be a little graphic for children to view. Milking a freshened heifer for the first time is often a very different experience than milking a mature cow. This is something to be aware of when purchasing a heifer, that this can be a very difficult, gradual process if you are both new to milking! Your goal and hope is to have an easy smooth transition, depending on the temperament of the cow and the person and preparation before the event. This section is best read several weeks before calving, as much of the advice requires prep work before the calving takes place. Yay, the baby is born! High five and celebrate success! 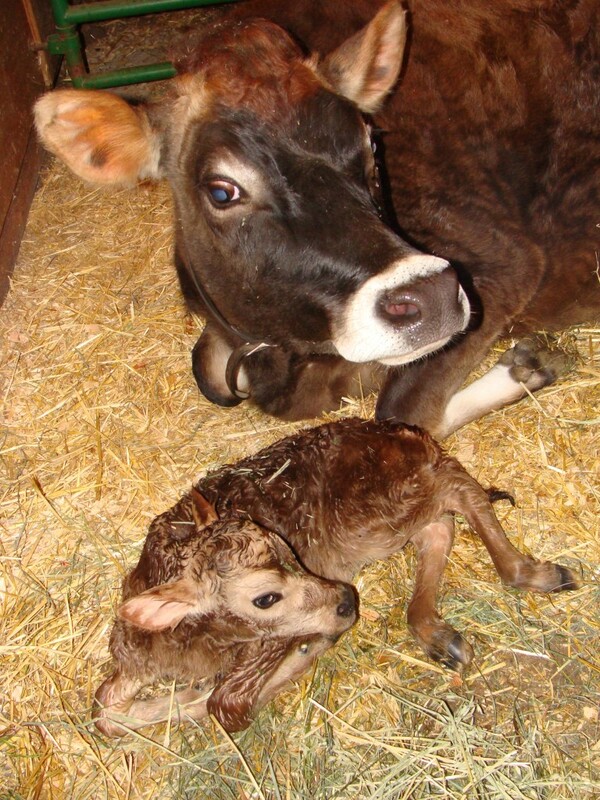 At first, let momma cow be with her baby – alone if she is nervous having people around. Let her lick the calf clean and at the same time she will hopefully expel her placenta (placenta should fall out within a few hours – please do not ever pull on the placenta tissue while still attached to the cow.). Most likely the heifer will be spraying colostrum (first immunity milk) and this is a great opportunity to either assist the calf to a teat OR grab a 4 pint calf bottle and milk out a full bottle of colostrum to then hand feed the calf. Ideally, a calf should consume 4 pints of colostrum within a few hours of birth, and every 12 hours for at least 3 total feedings of colostrum. A calf requires colostrum – please ensure they do get colostrum in the first hours after birth. Depending on factors, you can usually wait a few hours to milk the heifer out any further, waiting until your next scheduled milking time (or, 6-12 hours after calving). Why bottle vs. nurse? 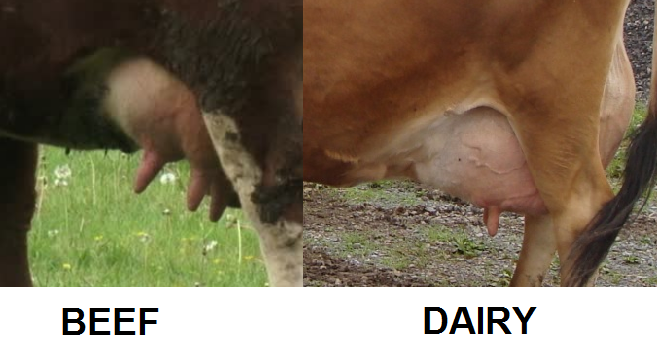 Because most dairy cows have been bred toward udder conformation befitting a milking machine – teats evenly squared underneath the udder and pointing straight down. This type of placement can be difficult for a newborn to detect, so a bottle feeding ensures that first colostrum is consumed in a timely manner. Mom and baby should settle down and rest after their busy activity. Let them rest a while in peace and head back to the house so as not to disturb them. Practice before calving – bring the heifer to the parlor area and give her a handful of grain or brush her with a soft brush. Teach her this is a happy place to be. This works even better when milking other cows and the heifer can see the routine and follow the cows around. Avoid stimulating udder by touching it other than to apply cream to soften the stretching skin. Udder creams can greatly help a heifer feel comfortable and help avoid cracking, flaking, sore skin tissue. Practice working with the heifer – take her on walks with the halter on. Pick up her feet and clean them out or even trim them if the toes are a little long. Teach her that you are a friend to be trusted. The first milking should be done in an area with very even, grippable footing. A heifer will most likely be scared, and falling down is a quick way to scar them from wanting to come back. In our current facility, we were able to put up a board and milk to the side of the milking stand so that our excitable heifer was on firm footing. The area should also be such that she can not move around too much. A stanchion will work, or boards can be temporarily secured on both sides of the milking area. Avoid any pinch points. We kept the heifer’s halter on and tied her closely to a O ring with a quick release knot. Then we put the surcingle over her back and hooked it on (this is something you can practice before she calves). Next we turn on the vacuum pump. Let her stand and relax to that new noise. She’ll soon learn to let her milk down when the pump turns on. Bring the milking machine near to the milking area so she can hear the pulsator clicking and recognize it. Calmly talk to the heifer and place your hand on her rump, then run your had down her rear leg to the top of her udder and down her udder to the teats. Reach in and dip each teat with pre-dip. Wait thirty seconds and wipe off very gently – she’s probably sore! Slowly bring the machine underneath her as needed (depends on style) and place on one inflation at a time. Stop and rub her udder and talk to her for a second between each one if she gets nervous. Stay near the machine and if necessary keep your hand on the machine or claw to keep it from falling off as she invariably wiggles. Milk out as much as you can in a short time frame, then very delicately remove the machine. One person can turn off the pump and remove the air hose from the machine as the other person removes the inflations from the heifer by first releasing suction from one of the teat cups (you can use your fingers to move the teat away from the inflation to allow air to exit). Keep calm and praise her for doing well (even if she didn’t). Talk to her as you post-dip each teat. In the milking machine, you may not have much (half gallon or less) or you may have a good amount (2 gallons or more). Tailing -Have one person lift the cow’s tail up and hold it up near the base. This is awkward (but does not hurt the cow) and will make her unlikely to kick. Tying head up – keeping her head at a natural level or a little higher makes kicking more awkward than if she had the ability to put her head down. Also, having someone at her front side, talking to her and caressing her head and neck can be soothing. Anti-kicker – a device you can purchase to put across the back of the cow that helps keep her from kicking her back legs up. If used, only use it for as short of time as necessary because a cow can become conditioned to it and become unruly if she gets milked without it! These are all short term solutions to calm a nervous animal. As soon as possible, these tools of assistance should be tapered off, because a cow needs to learn to be calm and find a comfortable routine. 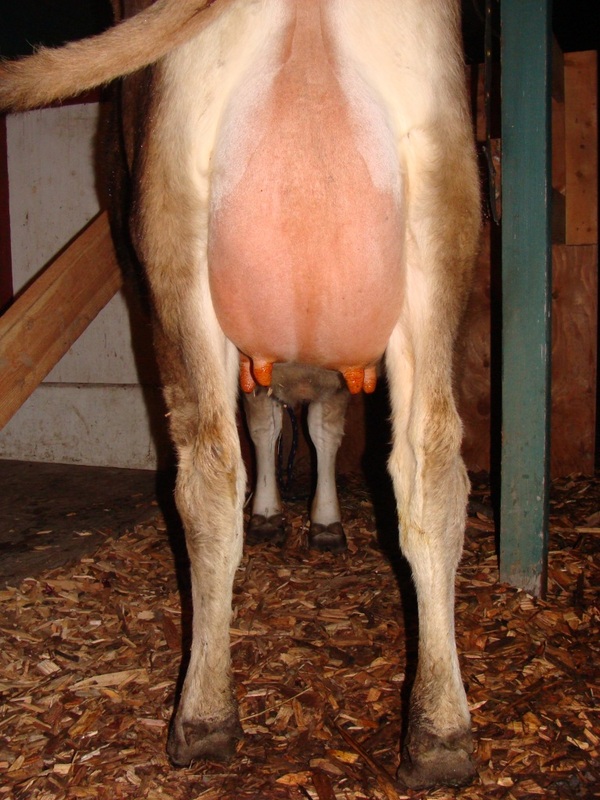 Before milking, her udder will look something like in these photos. 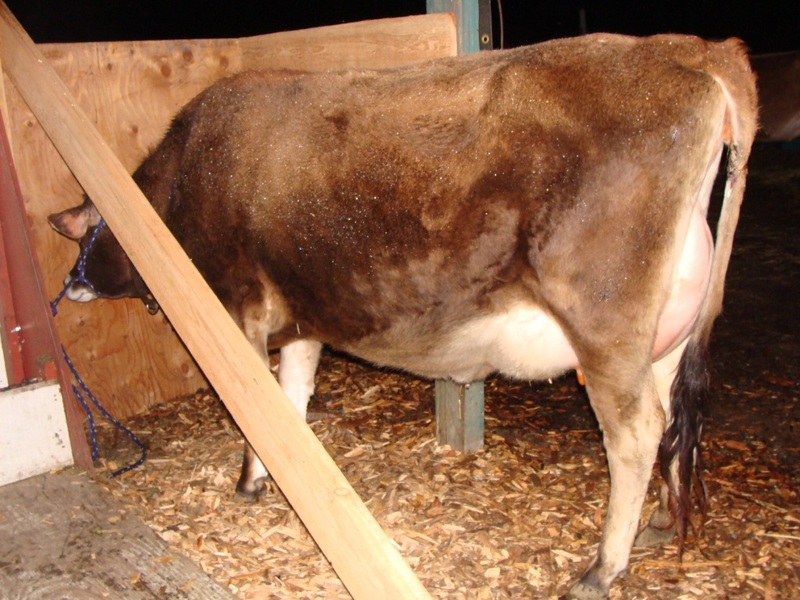 (Read up on EDEMA – a heifer is the most likely to have significant edema because this is her first time “creating” an udder. 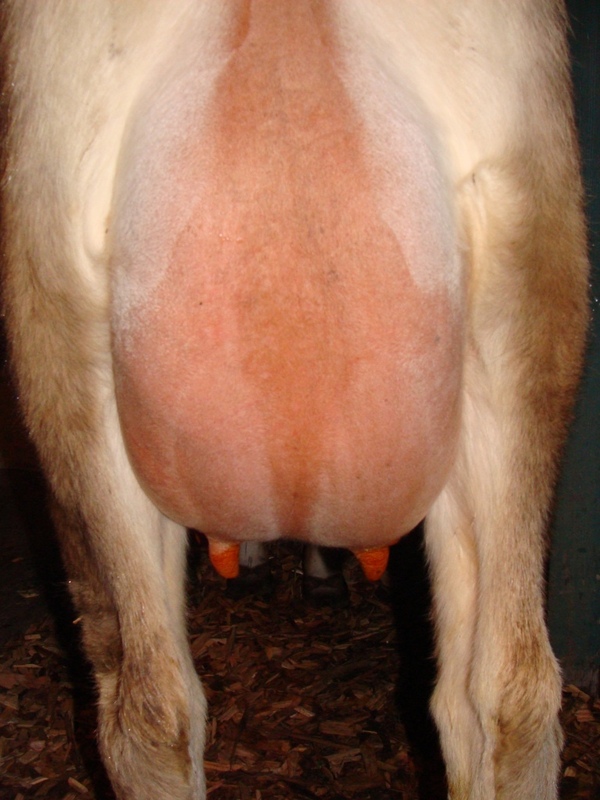 After the first milking, you may see VERY LITTLE, IF ANY change in the shape of the udder – that is NORMAL. As she continues to get milked over the next few days and weeks, she will slowly gain udder quality. 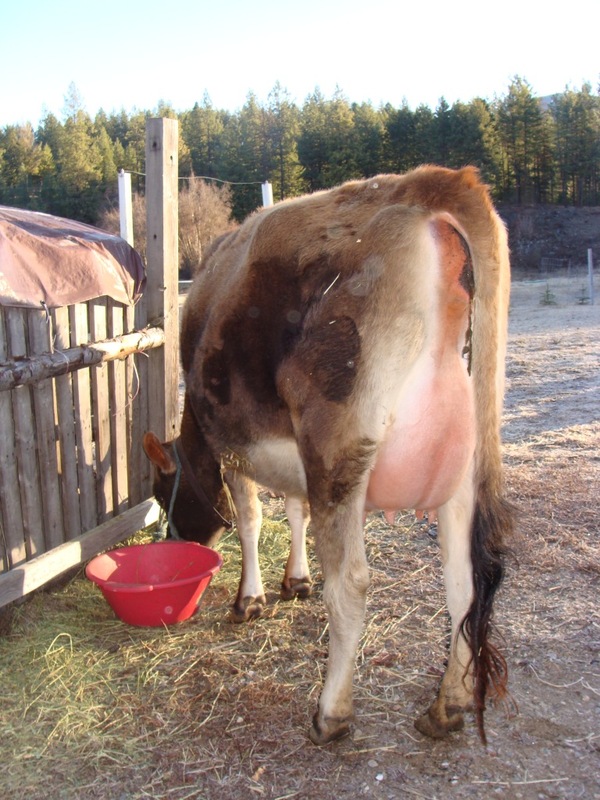 The wrinkles in the photo below indicate she is losing the edema and gaining flexibility in the udder tissue. Each milking should get easier. If you see wrinkles on the bottom but the top continues to stay looking like it’s un-milked – the heifer may be HOLDING UP her milk. When you milk her, she will start out giving milk but will quickly taper off to a dribble. That’s because you have emptied the milk cistern in each quarter (which she cannot force to hold up) but she has not released the rest of the milk – in the ducts. Another way to tell is if the colostrum clears after a few days and the heifer’s milk is very thin – not creamy at all. Sharemilking can (and most often with a first calf milk cow) cause a cow to hold up her milk – she can willfully refuse to give it to you, in order to “save” it for her calf (she doesn’t realize she has too much for the calf, it’s just her instinct to only feed one baby, and sometimes you’re not her baby, if you get my meaning). Some people are able to create a suitable routine of “sharing” milk with a calf at milking time by separating the calf and bringing it in at milking time to help stimulate let-down and nurse one or two teats as the person milks the others. Please research this in detail and remember all cows are unique in personality, they may or may not go along with your plans. 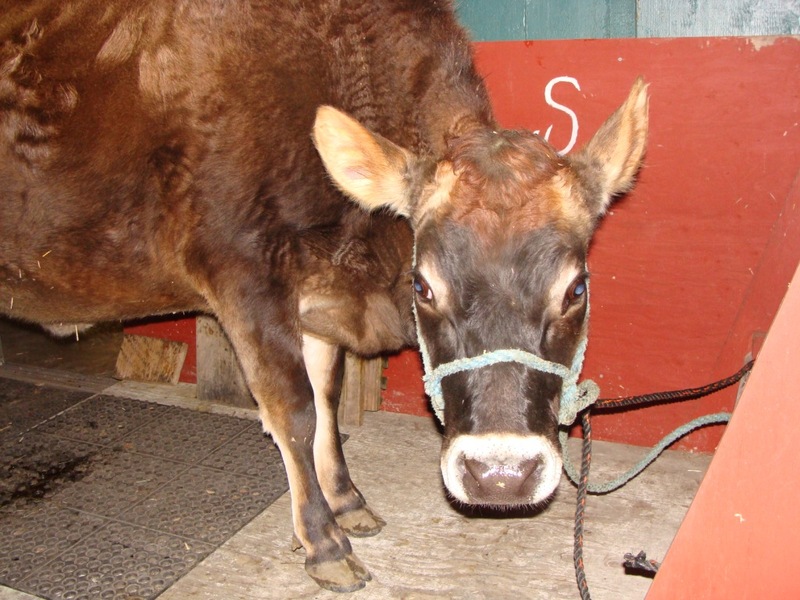 Edema – For the first few milkings, the cow may associate milking time with being uncomfortable if edema is preventing her udder from being emptied of milk. Stress – Some cows are just more high strung than others. 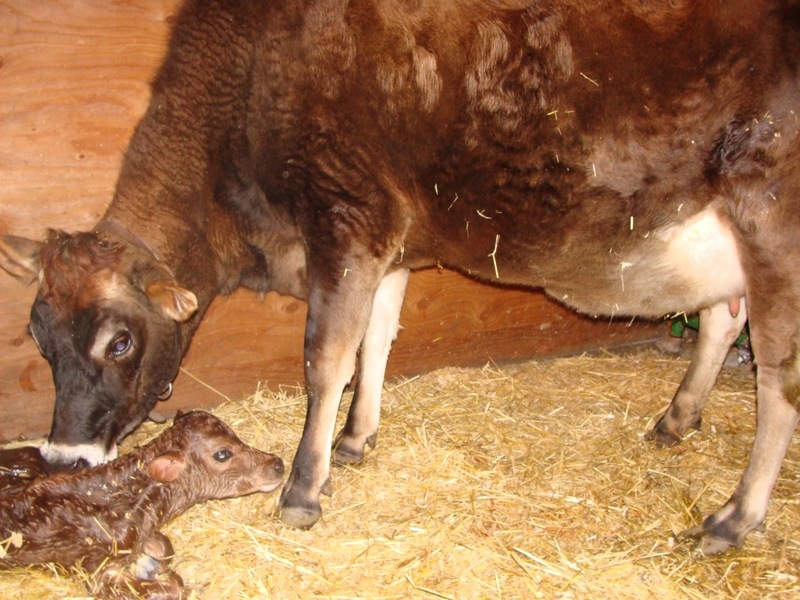 We had two heifers calve very close together – the first was dramatic and held up her milk for two weeks! The second was a cakewalk, pouring out her milk to us gladly and quietly. For the stressed cow, we ended up having to give her oxytocin (the natural hormone cows release to stimulate the let-down of their milk). We have her a full dose (2cc) in the rump for several milkings, then tapered off to 1cc, then to 1/2cc, then 1/4cc, then quit. She was a dramatic case, in that most cows will start to give you their milk after only one or two times of giving oxytocin (once they realize how good an empty udder feels!). Once we got her giving us her milk (by oxytocin, then by her own will) she started to look like this below – wrinkly!! As soon as the cow calves, she should be started on a milking routine. If starting her off in an alternate location, bring her to the main milking area as soon as reasonable. Make her part of the group or part of the family and you should have a long-lived successful relationship! Part Four: After Milking, a Treat! We choose not to feed out cows during milking time (because they become monsters if they run out of feed!) – so we provide an after milking treat of alfalfa flakes with grain sprinkled on top. This is a good place to add some supplements such as Fastrack probiotics, kelp, etc.